There are so many things to write about living in Italy; the people and their way of life, the history that surrounds you every day, and the incredible food (my favorite). When people ask me if I miss Italy my reply is, “every day at dinner time.” When I first arrived in Naples in January of 1982, I remember seeing this huge volcano called Vesuvio and was amazed by how close it sat next to the city of Naples when we landed. Even back people said things like, “it’s overdue” and “it’s going to blow soon.” Over the next thirty plus years I would live there numerous times and visit Mount Vesuvius often, so many times that I should have become bored with it – not so. The numerous times friends came to visit, I would take them to the crater of Vesuvio and it was as amazing for me as it was for them seeing it for the first time. The above photo was taken when I was getting back in to photography in January 2007 with a Sony DSC-W7 pocket camera on a little mini tripod that costs me 10 Euro. I would take many more photos of Vesuvius and honestly, it was as exciting for me the final time as it was the first. 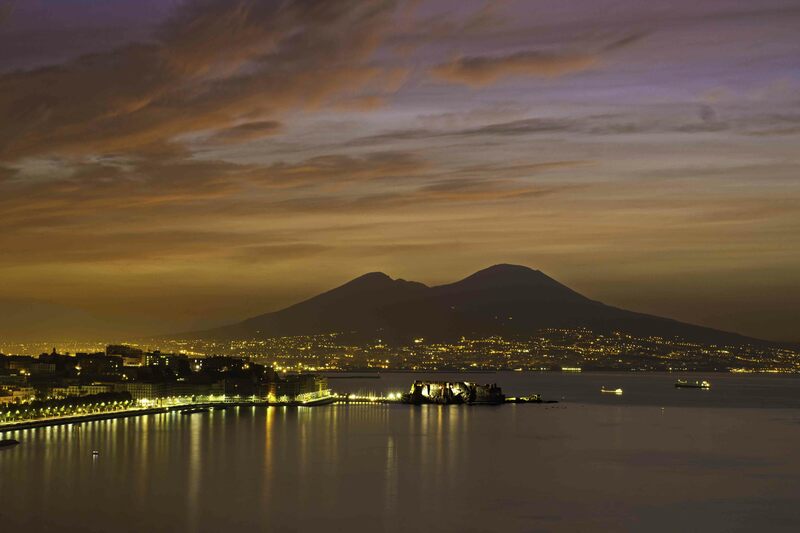 This photo on the left, Vesuvius, was taken on December 21, 2011 at sunset with the sun behind me as I shot. I knew I’d be taking plenty of sunrise photos so I wanted to try something different. In order to hopefully give the photo a little pop, I really wanted to shoot Vesuvio with snow on its peak. You can see the traffic moving on the Tangenziale in the lower left corner as well. Vesuvius was shot with a Canon Rebel XSi, EF-S 18-55mm USM kit lens at f/4, 1/12 sec, focal length 27mm, and ISO 100. It was good thing I shot this when I did because it was one of the last times there was snow on the mountain before I left. There is a section of Naples called Vomero, on its hillside runs a little curvy road called Via Orazio that continues down to the water in Mergellina. It’s the perfect place for panoramic and sunrise photos of Napoli because of the view of the Bay of Naples and the numerous places you can set up a tripod. If you don’t believe me, check out these photos taken from Via Orazio at Google! October Sunrise (right) was shot on October 13, 2013 with a Canon Rebel T3i, EF-S 18-55mm USM kit lens at f/8,1/8 sec, focal length 23mm, and ISO 100. The photo to the left, Sunrise at Naples Harbor, was taken in Mergellina next to the Castel dell’ovo on April 7, 2013. These days, I rarely go out shooting if there are no clouds. Shooting on a blue sky day makes for boring photos, give me clouds any day! This photo would have a completely different look with a blue sky, I believe the clouds add an element of drama the way the sun pokes through. The sailboat is an added feature too. This was shot with a Canon Rebel T3i, EF-S 10-22mm 3.5-4.5 USM lens at f/9, 1/80 sec, focal length 22mm, and ISO 100. Great stuff Bill. I miss that mountain and the people who live in its shadow too! Thanks Dave, if I went back to Naples tomorrow taking a couple of shots of Vesuvius would be one of the first things I’d do!